Size: 380ml tube Coverage: 10.5m based on 6mm bead. Acoustic Sealant is a high density mastic designed to be more efficient at stopping noise leakage through small holes and joints in walls, floors and ceilings. Due to its unique formulation, it will always remain flexible enabling it to flex when there are temperature changes that cause structures to shrink and expand. As well as being intumescent making it suitable for use in fire resistant structures it can also be painted. Acoustic Sealant is a water based, white acrylic sealant supplied in large 380ml cartridges so longer application guns may be required. As well as being higher density than normal sealants it will always remain flexible and can be painted with emulsion paint as soon as it is dry. It can also be painted with gloss but must be allowed to dry for at least 12 hours before doing so. Acoustic Sealant is intumescent so in a fire situation it will simply expand and char making it incombustible. 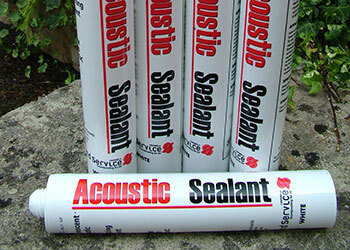 Ideal for sealing joints of floorboards or sealing the expansion gaps of floating floors. It can also be used to seal joints of plasterboarded stud walls and ceilings to make them airtight thus reducing the possibility of noise leakage. Our Acoustic Sealant is also a multi-purpose sealant that can be used for most internal applications but because it is water based is not suitable for external applications. When ordering, we can also supply a longer skeleton gun if required.